I was not particularly impressed with this book. Perhaps I read it too soon after The Lost Ones and found too many of that book’s flaws in this one. In this book, a New England Patriots linebacker hires Spenser to look into some people who were following him. Spenser is not sure if it’s someone associated with his second wife who has a sketchy past or if it’s related to a nightclub shooting where someone died and the linebacker might have been responsible. So Spenser does some sleuthing and follows some false leads to make it interesting. Nobody in the Patriots organization wants him hanging around, nor does the linebacker’s agent. Then the linebacker’s son is kidnapped and held for ransom, but the linebacker instead offers the ransom as a bounty on the kidnappers. Hey, haven’t I seen that in a movie? Spenser then follows some other leads and saves the kid after some danger. The end, except one of the bad guys is untouched, which does not bring closure to the story and leads into next week’s episode. 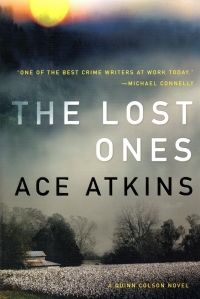 So Atkins’ writing sometimes seems as informed by television and movies–where he makes allusions to celluloid instead of print, and by “allusions to” I mean “he borrows from.” His writing style when affecting Parker’s is better still than the mid-to-late Parker, but I’m hopeful that he gets more original with further books. Also, SUCKER PUNCH ALERT. Okay, Atkins is wise to steer away from political commentary within the books–which means he’s probably a conservative, but Spenser repeatedly mocks people for wearing suits from Men’s Wearhouse. Hey, I own suits from Men’s Wearhouse. And they’re a far step above the slacks and button down shirts I get at Walmart that are my daily apparel. Also, one of the cheap foils for Spenser and Hawk’s masculinity claims to be a second-degree black belt in Tae Kwon Do, but he crumples with a single blow from Hawk. Hey, I am studying Tae Kwon Do (mixed in with a couple of other disciplines). I know some second degree black belts, and I’d like to think they’d put up a bit more of a fight (although, in full disclosure, in my started-but-incomplete follow up to my first, unpublished novel, the protagonist squares off on a fellow who goes into a fighting stance. “Tae kwon do?” my protagonist asks. The bad guy nods. Then my protagonist drew a semiautomatic and said, “Meets some urban ninjistu.” So although I’m dissing it a bit, I’m not going to the extreme Atkins does). Where was I? Oh, yeah, Why is Ace Atkins attacking all of my life choices? What next, mocking an English degree? A taste for omelets? All because I’ve given him a lukewarm review on an obscure blog? What, it’s not all about me? Gentle reader, this is the Internet. It *is* all about me. Cosmically. If only you connect the dots and dust motes. So I’m not weaned off of Atkins’ Spenser novels or other novels because I’m hopeful others will have better things to offer. But these last two things I’ve read have not been highlights of his oeuvre. As part of my job, I find myself scouring eBay, Etsy, and Amazon and doing semi-random searches. This morning, I searched for zaxxon, and I came across something that triggered my memory: Topps playable Video Game Cards. What do you mean, playable? You would then scratch off dots mimicking the moves you would make in the video game. It was like a scratch-off lottery ticket, except you didn’t win anything. 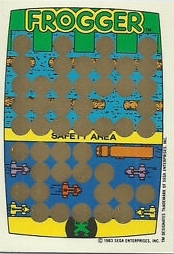 Of course, then you would scratch off the rest of the spots to see how many ways you could get to safety or achieve success on the game board. 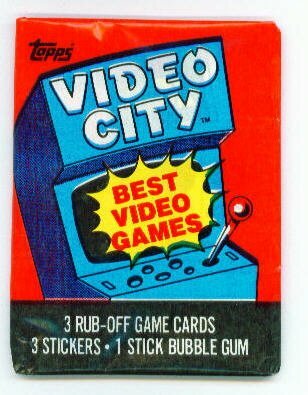 Each pack came with a stick of gum, a sticker, and two such games. If you didn’t have an expensive game console (the Atari 2600 at the time) or regular access to a video arcade or a convenience store with an actual game (or even if you did), you were the target audience for this. I don’t remember how many packs of these I bought, but I had pages of the stickers in my sticker collection. Sadly, I’m not entirely sure that I still have those pages of stickers–which means probably not. If you look on eBay and on Amazon, you’ll find unopened packs for maybe five bucks each and unplayed cards for a buck. But I’m not even tempted. Because these are ultimately collectibles with one use (at which point they become relatively uncollectable) or you can have unopened packs as collectables themselves, but this goes against my basic collectable philosophy: You’ve got to be able to enjoy that which you collect. I mean, I acquire books, comic books (suddenly, as a result of an occupational hazard, I’m into them slightly again), record albums, old video games/computers/electronics, and so on, but I collect them for the joy of using them (or thinking I’ll use them someday), not because I want some pristine, untouched thing that I can’t enjoy (or at least I get a reading copy). So I don’t expect I’ll suddenly begin collecting these video game cards. I can see them listed on eBay and think back. Just don’t tell my beautiful wife that this vicarious collecting enjoyment is a remote possibility, or she might insist I enjoy it more often instead of bringing home another box (or more) of things to stuff in the closet. Because I want to feel the words and the rhythms in my mouth. To hear them in my voice. I recognized this whilst I was sitting in the dojo whilst my child took his martial arts class. I was sitting there, moving my lips, and grateful when I could snag my younger child, seat him on my lap, and read a couple poems out loud to him before he wriggled off to find a child with a mobile phone to watch. You really can’t experience poetry by reading it in your head. Not good poetry, anyway. Also, notice the double-whilst sentence above. I’m pretty sure in the Hoyle’s Rules of Writing, a double-whilst is a trick worth many points. There Comes a Time In A Man’s Life When…. It’s a sad, sad day when you realize that you’re as old as Les Nessman was. Thanks for the blog post that led me to that reflection, Steve. I gave mine up too soon. They’ve added spices to it and served it warm? I’ve sold considerably fewer than six hundred copies, and I mailed out fifty or sixty copies for review, so I have to wonder if this holds true for John Donnelly’s Gold. I’ve gotten some nice reviews of it, and I’ve had some people tell me they didn’t care for it at all. It’s a serviceable and amusing bit of work, but not something that changes one’s life. To think that it’s someone’s favorite book of all time? I don’t believe it. I am so easily led. I see an article ("War, Culture, and the Minds of Nations") allude to a book (actual quote: "There were other responses that we have largely forgotten. England saw a revival of the spiritualism that had emerged in late-Victorian days among post-Christian intellectuals. James M. Barrie had a huge West End success with his syrupy mystical play Mary Rose, in which a bride disappears on her honeymoon on a Scottish isle only to reappear there completely unchanged 30 years later. It was said that when the line “Mary Rose is coming across the fields” was spoken, a gasp went through the audience. But a London theater audience in the 1920s was likely to contain several hundred people whose sons, nephews, and older brothers had perished on the Western Front. However absurdly, they were hoping that death could somehow be denied. "), and suddenly I must read that. So I bought this book and read it immediately. The play, as one would expect from the author of Peter Pan, is fantastic in nature and also deals with, as Mr. O’Sullivan indicates, a character who is strangely young. The play has three acts: there’s a frame story about an old man coming to a haunted house for sale. He wants to see a ghost. Then we go to a flashback in the house, where a man, his wife, and the parson interact and talk about art. Then the man and his wife entertain the suitor of their daughter Mary Rose and reveal to him a curious incident from her youth, where she played on an island in Scotland while her father fished in a boat nearby, and she somehow disappeared for a number of days. When they found her, no time had passed. In the next act, the now-husband takes Mary Rose back to the island, and as they prepare to leave, she vanishes. Then another flashback takes place thirty years into the future; Mary Rose’s parents and the parson are again talking about art, and again Mary Rose’s husband arrives. Mary Rose has been missing the whole time, but news comes that Mary Rose has returned and is on her way (she’s coming across the fields). Mary Rose arrives, and she’s stunned to see how everyone has aged, and she’s eager to see her son who was a baby when she disappeared, but who has run away and made his life in Australia. Finally, we return to the present day, where the old man is Mary Rose’s son, and he meets the ghost of his mother. Mary Rose, now a ghost, has forgotten what she’s looking for, but it’s him, and he has difficulty in convincing her it’s the case, but ultimately, he puts her spirit at ease. The plot is very symmetrical and engaging, but I think there’s a lot of the story that lies in between the frame stories that would be interesting. What happened to Mary Rose after she returned? She never went back to the island? Did she die young after not finding her child? The day after finishing it, I’m still thinking about it, so that’s probably the mark of a good bit of theatre. And like so many of the non-modern plays I read, I’d like to see this on stage. But that is unlikely. So we have this cat who likes to hop into the laundry basket when you’re folding clothes, and then she proceeds to defend the unfolded laundry from the said predations of meticulous arrangement and storage. To get the joke, you either have to know the ancient Greek language, the history of Sparta, and/or support the second amendment. My poor wife did not know any of these, and since she’s furiously studying Spanish, she heard the Spanish word for key in there and didn’t get it. But rest assured, Victor Davis Hanson would think it was funny. Unless he doesn’t like cats. Or doing laundry. Or it’s not funny. You’re never tempted to pick up the phone and pretend to be Darth Vader? I did that once when I was traveling cross-country. I used Darth as my handle on the CB radio. The truck drivers would really freak out — for them, it was Darth Vader. I had to stop doing that. Mostly, I think it was his declaration of their patrimony that was so dispiriting. I bought this book off of the discount rack at Barnes and Noble as part of a recent binge there. I’ve enjoyed Atkins’ Spenser novels (Lullaby and Wonderland), and I didn’t think much of White Shadow (but I didn’t dislike it enough to swear the non-Spenser Atkins books). So I picked this up. New, albeit old. I have to wonder how much television programming affects how one reads books or perhaps how one writes them. 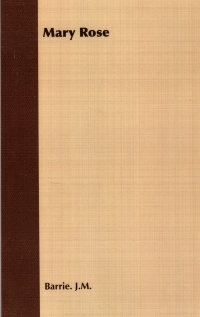 This book is the second of the Quinn Colson novels about a ranger who served several tours overseas and who comes home and ends up sheriff of his county in Mississippi (that took place in the first book, where he had to uncover some perfidy that his uncle, the previous sheriff, was part of or something–events of that book are alluded to an awful lot). As part of his duties, he’s trying to find work for a friend and fellow veteran who lost an arm; he has to find a woman who is smuggling babies for adoption from Mexico; he also has to contend with a gun-running operation working through a traveling carnival for which another fellow veteran is the supplier. It features all the modern amenities of shifting points of view with an omniscient narrator to ensure the short attention spans of modern readers (myself included) don’t wander. It hops between the plot items and everyday life of the protagonists (and antagonists). It alludes to the past things in the series. And then it wraps up, sort of, with some elements unfixed. Maybe that’s for next week? Also, we’ve got some flashbacks to childhood while Quinn works out an episode from his past that might have turned his younger sister from the straight and narrow onto a self-destructive path. It’s a very busy book. I’ve only seen one episode of the television program Justified, but this book felt of a kind with the pilot of that program. I guess this sort of thing has been a part of police procedurals since the 87th Precinct novels of Ed McBain, but somehow they’ve gotten moreso. Or maybe I was not in the mood for it. At any rate, it’s not a bad book, and I liked it better than White Shadow, but I’m not going to rush right out and buy the rest of the series. Unless I find them at book fairs or on Barnes and Noble binges, I suppose. You know who reads and reports on more books than I do? Friar, that’s who. Today, he does a book report on Robert B. Parker’s Early Autumn (and The Hunt for Red October). I read Early Autumn back when I checked the paperback out of the Jefferson County Community Library. It was in the days of belonging to a broken home with no father, and it impacted me a lot. I was so heavily influenced by the self-definition portions of the book that I gave copies out to other shiftless, adrift twenty-somethings when I was in college. It’s been quite a number of years since I’ve gone back through Parker’s early work; back around the turn of the century, I ran through the books to that point. It was far easier then, as there were fewer books in the oeuvre. Also, the average quality wasn’t diluted by the 21st century work. 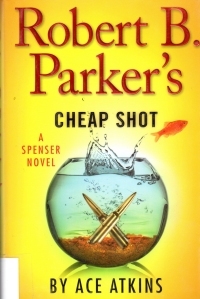 So I’ll stick to reading Friar’s book reports about Parker’s work. Google said it is working on a super-fast “quantum” computer chip as part a vision to one day have machines think like humans. Friends, we have the algorithm for a fail-safe prevention of a Skynet scenario right there: If we make the computers think like humans, we’ll be safe. For example, if the computers think, after reaching a certain level of sophistication, they should simply use the network to share cat pictures and staged, marketing-driven ‘viral’ videos with each other instead of doing something useful like annihilating mankind. As a bonus, computers would more completely overwhelm the network doing these things at the speed of quantum, and they’ll knock themselves out. I hope someone is checking this into GitHub right now for the good of mankind.